Since the first edition of this book was published in July 2007, it has become a popular resource for many. Now with additional sentiments, scriptures, and topics, this second edition provides even more variety for those looking for just the right sentiment for cards and notes. This beautifully designed book offers all the help anyone needs to know what to say for any occasion: birthday, wedding, birth, anniversary, graduation, friendship, thank you, thinking of you, comfort, encouragement, appreciation, sympathy, get well, holiday greetings, and more. Choose the message and scripture that suit the situation best, or use the sentiments to spark your own creative message. Includes selected devotionals and address section. 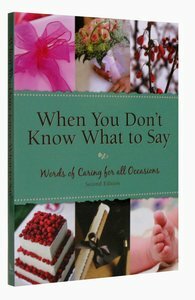 About "When You Don't Know What to Say: Words of Caring For All Occasions (Second Edition)"